This is a review of liveaboard dive boats that offer extended access to scuba diving on the Great Barrier Reef. Departure points for the vessels selected in this review are either from Cairns or Airlie Beach in northern Queensland. 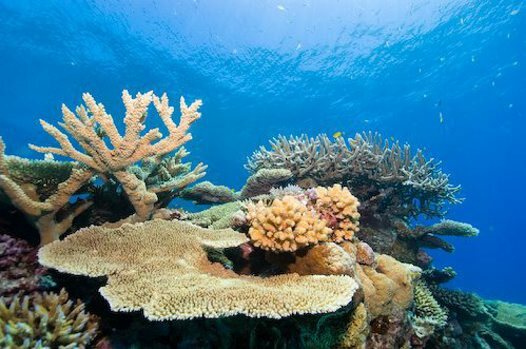 You are probably already aware that in 2016 the Great Barrier Reef suffered from a major bleaching event. This has precipitated new interest in Great Barrier Reef tourism because many people are fearful that the reef will not be able to recover. They want to see it before it is gone forever. Of course we don't know at this stage how long term this damage may be. Nevertheless day trips and liveaboards on the Great Barrier Reef are experiencing a resurgence in popularity. All of the boats in this review are previewed and available on our website. All of these vessels are crewed by seasoned professionals with real local knowledge and experience. These boats are not presented in any order of preference because they are all different with different destinations. Comparisons are not really relevant but you will be able to gauge which one best suits your concept of a Great barrier Reef dive liveaboard. I will start in cairns because it is furthest north. 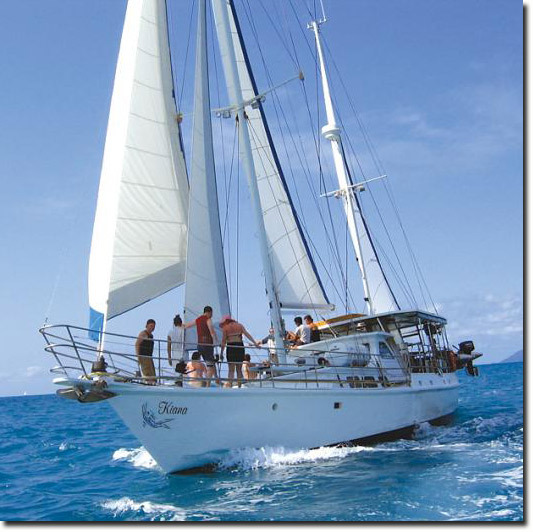 Spirit of Freedom is the pick of the Coral Sea liveaboards. Sleek and beautifully appointed she can cater for 26 guests with a minimum crew of 10 to cater for all your needs. Trips are 3, 4 or 7 days. For the Cod Hole itinerary the minimum level is Open Water diver (Scuba Diver not accepted). 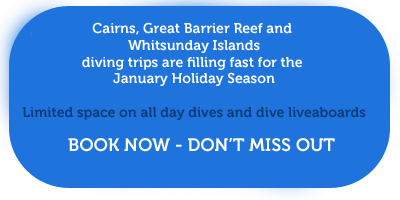 For the Coral Sea a minimum of Advanced Open Water Diver with 20 dives is recommended. Currents can be quite strong and experience with these types of conditions is necessary. Operating between Cairns and a number of specially selected Great Barrier Reef dive sites is the Scuba Pro fleet. Three identical vessels that are able to operate 3 day/ 2 night recreational liveaboard diving 6 days per week departing from Cairns everyday except Tuesday. This is a high quality professionally run operation that is so popular that you will have to book weeks ahead to ensure your place. Head 700 km south from Cairns to Airlie Beach - gateway to the Whitsunday Islands. The Whitsundays are renowned for great sailing with long periods of south east trade winds providing ideal sailing conditions. Combine this with an abundance of coral and marine life on the Great Barrier Reef and you have a perfect opportunity for a sail/dive liveaboard cruise. 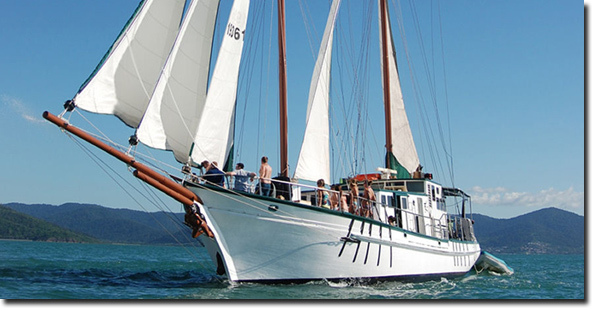 Atlantic Clipper is a big, spacious, modern sailing ship with a host of extra activities included. 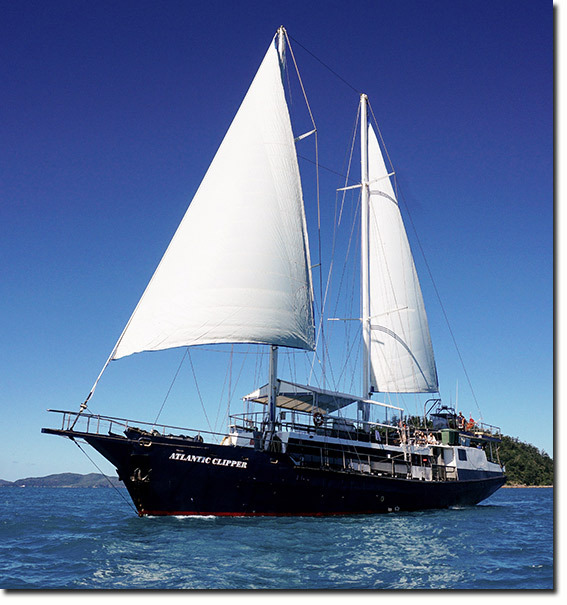 Atlantic Clipper offers a 2 day/ 2 night sail/ dive liveaboard cruise in the Whitsunday islands. New Horizon was built in 1994 in Launceston out of Tasmanian hardwood. The 97 foot ketch rigged sailing ship offers customers a very stable and exceptionally strong classic sailing experience. She offers both double and single bunk style accommodation in her three huge, fully air conditioned cabins and comfortably takes 32 passengers.